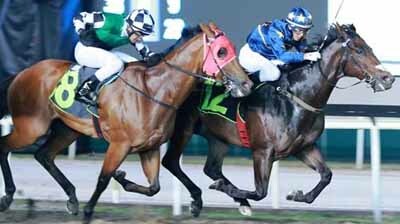 Apprentice Ng Choon Kiat returned to race riding after recovering from a trackwork fall last February and immediately signalled his return with a win at Kranji tonight on a horse few, perhaps including himself, had expected to win. Although LIM'S REFORM has four previous wins, his last success came 11 months ago and his recent form has been anything but inspiring. Ng was riding the O'Reilly gelding for the first time today but showed full of confidence as he brought the six-year-old from a long way back to win drawing away by half a length. LIM'S REFORM paid $336. "I don’t know this horse at all. I’ve never even ridden him in trackwork," said Ng. "I was really surprised but I’m also very happy to get my first win at my first night back. It’s been tough with the elbow injury, but it’s behind me now and I hope to get more rides in weeks to come." LIM'S REFORM was just his second winner of the year.